ORIGINAL: Whilst we saw a side-on glimpse of him during the end credit sequence of “Marvel’s The Avengers,” it’s this week’s “Guardians of the Galaxy” that offers our real first look at everyone’s favorite Marvel super villain who, lets face it, kind of looks like a gold-plated male appendage. Yes, it’s the mad titan Thanos. Josh Brolin voices and mo-caps the character in two scenes in ‘Guardians’ – the first takes place about one-third during the movie and shows us the character in the flesh and on his throne. The second is a holographic video recording of just his face around the two-thirds mark. Now, a user known as ‘skiesthelimitx92’ appears to have used a phone to snap a photo of the character during that first sequence. 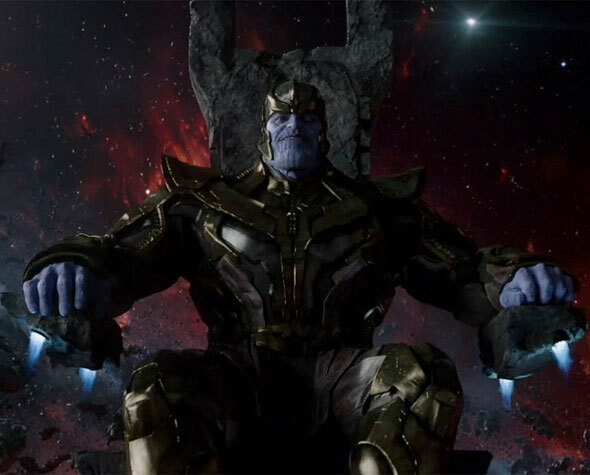 It shows how the Thanos in this film (and likely subsequent MCU movies) will boast a slightly different look – most notably the color which is a cooler purple compared to the hot pink of the one we saw in ‘Avengers’. 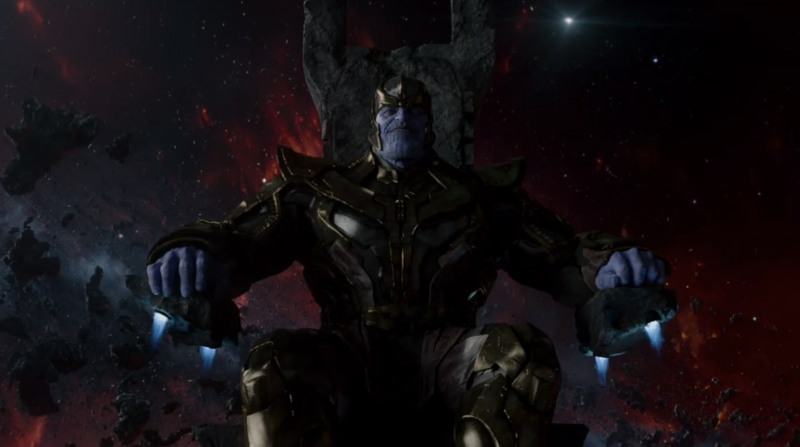 “Thanos needed to be this imposing character. He needed to have weight to him. So it was about finding the right person to fulfill that role, and we actually auditioned a lot of people for Thanos. That role really is a big commitment, because as everyone has guessed, Thanos is a big part of the Marvel universe going forward, and his role is likely to expand greatly. It was a big challenge to cast. He [Brolin] was brought on later, and we were good at keeping it quiet, so it didn’t come out for a long time. My brother Sean read for Thanos on set, and then we motion-captured Josh later on down the line, when we got back to Los Angeles. Josh was definitely the last person on board and we worked for a couple of days doing his motion capture.